Salespeople’s daily lives revolve around two apps: email and CRM. They use email for communicating internally and, most importantly, with prospects and customers. They use CRM for tracking their pipeline, managing contact information, forecasting and prioritizing their activities. Since email and CRM are indispensable for every salesperson, doesn’t it make sense for both these tools to work together? It’s not just the constant shuffle back-and-forth between screens or tabs, but the lack of either app playing nice with the other that is detrimental to sales teams around the world. Merging the two is a no-brainer, to be honest. That’s exactly what Zoho SalesInbox does. It keeps emails organized according to the sales pipeline, and makes updating the CRM as easy as dragging and dropping emails between folders. And starting today, SalesInbox is also available for users of Salesforce CRM. What does SalesInbox for Salesforce CRM do? Let’s take a look. Stop shuffling between tabs to access your email and your CRM. When we talk about combining email and CRM, we mean it: One sales pipeline, One tab. 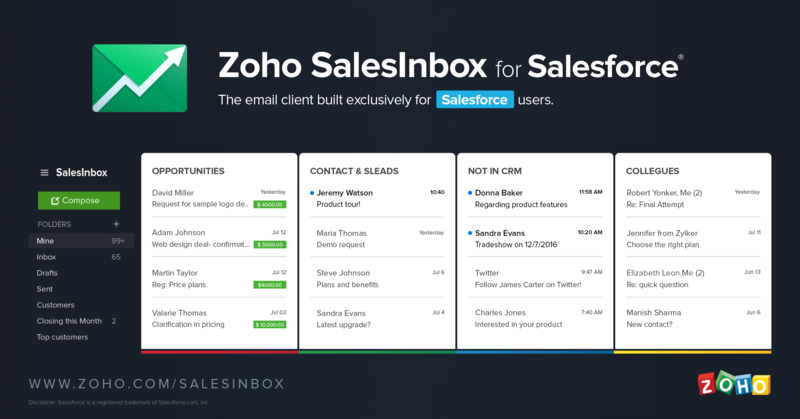 SalesInbox categorizes your emails from leads, contacts, opportunities, and colleagues into different buckets. Now that your emails reflect your sales priorities, you will have a clear idea of which email(s) needs the most attention. Simply drag and drop your emails across columns to move your deals across the sales pipeline in Salesforce. Simply drag and drop your emails across columns to move your deals across the sales pipeline, or to create a new lead, contact, or opportunity. Email and CRM are now BFFs. What do best friends do? Share everything with each other. Zoho SalesInbox makes sure your email account and CRM share contextual information, so you can improve your communication with customers. The timeline of various activities lets you know exactly where your customers are in the sales cycle and gives you insight into how to craft the best response. It’s because of benefits like these that tens of thousands of Zoho CRM users have been using SalesInbox since last July. We’re pleased to extend these benefits to users of Salesforce CRM, as well. Some people might find it odd that Zoho, maker of the best alternative to Salesforce, is making an app for the very product we compete with. But whether you use Zoho CRM or Salesforce CRM, our mission remains the same: we want to make it easier for sales teams to sell big. Get started today at zoho.com/salesinbox. 3 must-have integrations for Zoho.